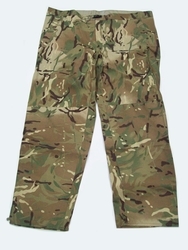 New unissued pairs of genuine goretex waterproof over-trousers in current issue MTP multicam camouflage pattern. Made of a heavier type of goretex than the current issue elasticated waist version, as these have zip gusset legs for easy on/off, and reinforced knees. Just released through MoD disposals, this type is now replaced in service by a lighter weight version, so in time this sturdy type of over trouser will become hard to get! Waist closure is by velcro with adjustable waist cord and cord-locks which ensure a firm yet comfortable fit. Label size 80/104/120, so in theory a 31" inside leg and a 42" waist...however when laid flat and measured the waist is a maximum 46" size... so really suitable for anyone up to 44" inch waist in reality! Label size 85/112/128, so basically a 33" leg and a 44" waist...however when laid flat and measured the waist is a maximum 48" wide so fit a 44-46" waist comfortably. Brand new unissued condition, still in poly wrappers.